Item B1 on the agenda for Monday's School Board meeting is a presentation of an analysis of the data collected via a community survey conducted by Fallon Research in March of this year. Here is the written report for your inspection, in the form of a survey summary as well as the survey presentation. While such surveys have been taken periodically over the years, this is the first case I know of one being presented to the Board during a regular meeting - at least in recent times. I thank President Lisa Whiting for putting it on the agenda. I hope this leads to an informative discussion, and as an input to our strategic planning. Your comments are welcome here of course, and you are also encouraged to exercise your right to speak before the Board during the meeting. How Should We Fund Our Schools? When I have the opportunity to speak to groups around our community, it's not uncommon for someone to make a comment about the 'unconstitutionality of property taxes.' It happened again when I spoke at a PTO meeting last month. Short response: Property taxes are not unconstitutional, nor did the Ohio Supreme Court ever say that property taxes cannot be used as one of the sources of funding for public schools. What they said was that the State of Ohio was failing to provide adequate state funding to the public schools, leading to an over-reliance on local property taxes, which in turn causes the poorer school districts in our state to be underfunded. Long version: Read it here. Besides, that set of opinions by the Ohio Supreme Court, collectively called "The DeRolph Case," is now moot, as the funding system in question when that case was heard was replaced first by the Evidence Based Model during the Strickland administration, and then by a temporary funding mechanism enacted in the first Kasich budget. We don't know if the Strickland EBM was constitutional, or whether the system Kasich will propose will be either - neither has been litigated in any court. But one point made by the Court during the DeRolph case still holds true: property taxes are by far the most stable form of funding for schools. Here's a concrete example of that. The Columbus Dispatch today ran a story about the downsizing of a pharmacy operation which is housed in the large industrial park west of I-270 at Roberts Rd. This company currently employs about 270 people at this location, but that will be cut to around 70. Let's assume that the 26 pharmacists being laid off are paid $75,000/yr, and the other 174 average around $35,000/yr. That puts the total annual payroll somewhere around $8 million. This facility is in the City of Columbus, so at their 2.5% income tax rate, these workers paid $200,000 of city income tax every year. That's gone. The City of Columbus will receive $200,000 less in income each year, and it will be gone the instant this company executes its layoffs. However, this building will still be standing. The company occupies a portion of a facility that in total generates $239,673/yr in school property taxes, and its owners will have to continue paying that tax even if the structure stands empty. 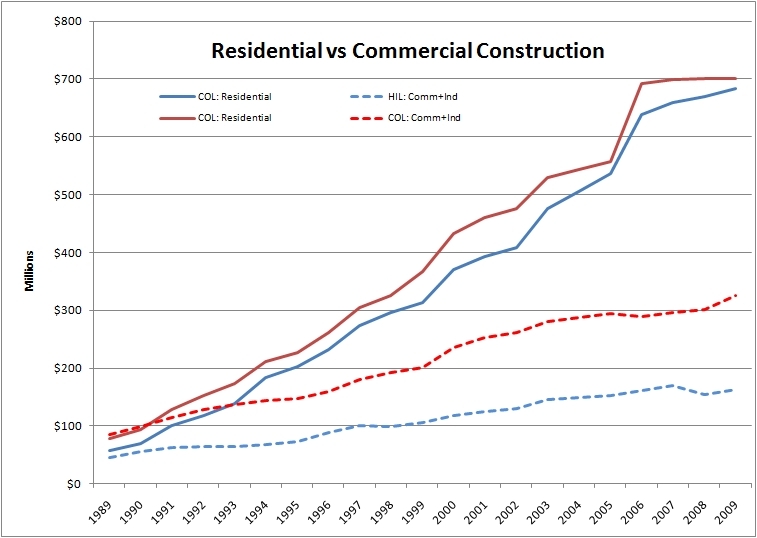 As a fellow commercial real estate investor, I feel their pain. 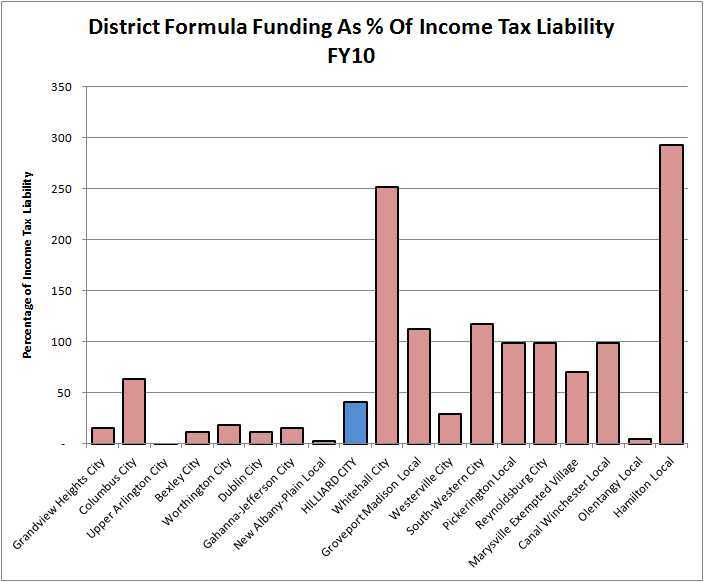 As a School Board member, I'm thankful we aren't taking a revenue hit like the city. This phenomenon is the reason most state and local governments have struggled in the past 5-6 years, but public school districts have generally been okay. 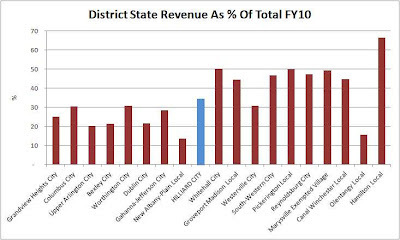 Many local school districts - especially the suburban districts like ours - are funded mostly by their very own stable base of property taxes rather than much more volatile income taxes, which is what funds the cities and the State government (and the Federal government for that matter). 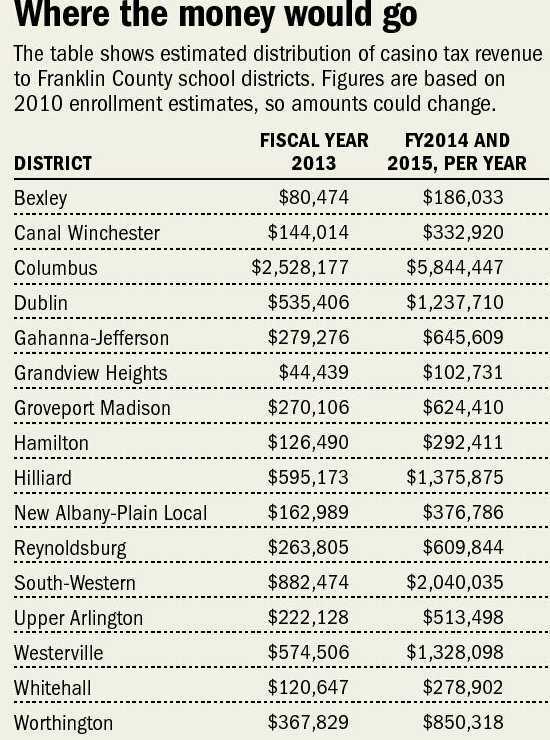 Statewide, the average district gets 48% of its funding from the State, but this varies from 14% (New Albany) to 76% (Huntington Local Schools, Ross County). So if we could keep 100% of the State income taxes we pay and use it to operate our own school district, we wouldn't need any State funding. But that's not how the system is set up. Instead, the more affluent communities - and ours is considered one of those - fund essentially 100% of the cost of their own school district, plus foot the bill for a couple of smaller, poorer school districts as well. By the way, I don't have a problem with that, although this is still not my preferred system for operating schools for the benefit of the public. Given a choice between property taxes and income taxes, I still believe property taxes are a better source of funding for our schools. Property taxes are more stable, plus Ohio's property tax laws prevent our property taxes from increasing (or decreasing) with changes in real estate values. That means that a school district must make its case directly to the voters when it wants more property tax revenue, and I think that's a good thing. But as a retired person with an income which has eroded significantly in this economic downturn, I wouldn't mind if our school district explored an 'earned income tax' as a means for raising new revenue, when that time comes. An earned income tax would shift the tax burden from those of us who are retired and with limited ability to generate new income to those still working (hope I'm scoring some points for transparency even if you don't agree with me!). By the way, this is the exact dialog taking place in regard to what steps should be taken to make the State Teachers Retirement System solvent again. Should retirees accept cuts, or should working teachers pay more? It's going to take some of both. Retired teachers and activists Kathie Bracy and John Curry have a great deal to say on this subject. While property taxes are indeed the most stable form of funding for our schools, it is a mechanism which is largely disconnected from the economic health of a community at any give time. When a community is rapidly growing, as did Hilliard from 1980 until 2000, the additional residential property tax collected on new homes doesn't increase as rapidly as enrollment, which is one of the key drivers of operating cost (the other being compensation & benefits). Most folks are surprised to learn that the incremental property tax revenue generated by the typical new house doesn't come close to funding the cost of the average 0.8 school age kids who come with it. It's actually less than half. When much of the new family housing is apartments - which generate much less property tax revenue per unit than a house - this situation is exacerbated. 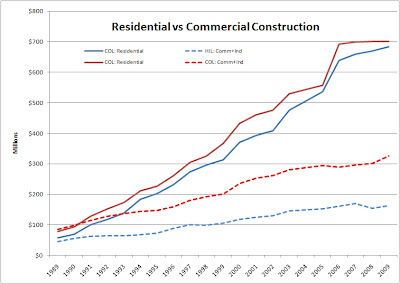 This makes it critical that commercial development happen at a similar pace, in order to share some of the cost burden of new students - which was not the case in our community during the last boom (note than the City of Columbus brought MUCH more commercial development to our school district during that period than the City of Hilliard, despite claims to the contrary). The consequence is that those already living in our school district had to raise their taxes to subsidize the cost all the new folks moving in, which is one of the reasons I've long campaigned to have the law changed so school districts could levy Impact Fees, as can cities. And when the economy falters, property taxes become an increasing burden on the people of the community, many of whom experience a period of very slight income growth, if not unemployment. This is when friction develops between the voters and public sector employees. It becomes pretty tough to vote for a levy to raise one's property taxes significantly (our last 5.9 mill levy increased our school property taxes 11.8%) when that money seems to be going to support a compensation and retirement structure for teachers, administrators and staff which seems pretty sweet in times like these. Of course, we've forgotten when things were reversed, and folks in the private sector were seeing their 401(k)s exploding in value while public sector workers were left behind. However we fund our schools, local or statewide, property taxes or income taxes, we need to figure out a way to match spending to economic conditions. With approaching 90% of our spending going to compensation and benefits, this is the same thing as saying school employee comp/benefits needs to be structured to track community income much more closely, up in good times and down in bad. I won't pretend that this conversation will be easy. But, after we get everyone - community and teachers alike - on the same page as to the economic reality of our situation, we need to have it nonetheless. This question is the source of much debate and angst in our country. Only two generations ago, it was rare for a young man, and almost unheard of for a young woman, to attend college and earn a degree. But that was also a time when the Industrial Revolution was in full swing. Many young men were lured away from the hard life on the farm to work as unskilled laborers in the coal mines, steel mills, and factories. It was still hard work, but better than having the family scratch out an existence on the farm. That generation - my grandparents - were also the grownups when our country fell into the Great Depression, then were compelled to enter World War II after the attack on Pearl Harbor. It was their children who ended up on the front lines of that war. Tom Brokaw gave those born in the early part of the 20th Century the title "Greatest Generation." I don't disagree. They came into this world at a time when a family was more likely to own a horse than a car. Their childhood was shaped by the agony of the Great Depression. As young adults, they fought and won World War II. Then they went to college. One of the greatest pieces of legislation ever passed by our federal government was the G.I. Bill, which enabled millions of our veterans to earn a college degree. They became the engineers, scientists, businessmen, and all the other professionals who led our country to a level of prosperity never before seen. Their journey was unique, and it made them tough and determined. They came back from WWII fearing little and believing they could accomplish much. And they did. Yes, they put a man on the moon, but they also built most of the infrastructure of our country and established our great industrial presence in the world. One of the spoils of their WWII victory was that most of the rest of the world's industrial capacity had been bombed into rubble, and it would take decades for our competitors to recover. They wanted to give their kids - my generation - everything: a nice suburban life away from the squalor of the cities; good, clean, new schools; and recreation instead of chores. And they wanted us to go to college so we "wouldn't have to work with our hands" like they did. So we grew up thinking that the skilled trades led to a less-than-desirable life - a consolation prize for those not smart enough or rich enough to go to college. A public university education seemed more affordable in my day. I think the tuition at Ohio State was about $300/quarter when I was a freshman in 1971, and the full-meal dorm fee was only $400. A four-year degree could be had for about $8,500 plus spending money. Today tuition, room and board at Ohio State is more like $20,000 - PER YEAR. That's a ten-fold increase! Of course, family incomes have grown as well over those 40 years. My Dad was an electrician for one of the largest industrial corporations in this country, and his W-2 income didn't surpass $10,000/yr until about the time I came to OSU. So the cost of college was about 20% of our family income. At today's college cost of $20,000/yr, family income would have to be about $100,000/yr to be the same percentage. According to the 2010 US Census data, the average household income for our ZIP code is about $70,000, meaning OSU costs nearly 30% of family income. No wonder college students are piling up mountains of student loan debt. Because the public school one's kids will attend is determined by one's street address, many families have already mortgaged themselves to the hilt just to buy a house in a great school district. There's not a lot of room to pay these kinds of college costs on top of that. But we've come to think of a college education as a necessity - like it's impossible to have a 'good life' without going straight from high school to college, and graduating at age 22 or so with a bachelor's degree. So we help our kids as much as we can, but more and more of them will graduate from college holding one piece of paper signifying that they've earned a degree that may or may not help land them a high paying job, and other piece of paper saying they're deep in the financial hole before they even get started. I believe there are two key things which have gotten out of whack, and my generation is the perpetrator. First, the cost of a college education is a consequence of political forces not so much concerned with raising the overall intellect of our country as they are making more money. By that I mean that the political decision to artificially lower the borrowing cost for student loans is not making a college education more affordable, it's making it more expensive - transferring wealth from parents and taxpayers to the education community. This is happening in exactly the same way as the access to cheap loans to unqualified buyers drove up home prices. Houses that weren't worth the taxes that had to be paid on them suddenly were selling for many multiples of what they had been before. That bubble eventually popped. A great many of the folks who were granted those subprime loans couldn't make the payments, and ended up defaulting. But at least they could let the bank foreclose, and walk away from the debt. Can't do that with student loans - they follow you for life. Likewise, colleges have been raising their tuition year after year, just because they've learned that as long as they don't raise tuition so rapidly rapidly so as to attract insurmountable political pressure (a "Boiling the Frog" strategy? ), students will continue to line up and take out their loans. Because colleges are professional services entities, they spend the bulk of their money on compensation and benefits of the faculty and staff, just like a public K-12 school system. In the case of Ohio State, that fraction is about three-fourths of the General Fund spending, according to their most recent budget. They plan for salaries to increase by 2%/yr, and benefits costs to increase by nearly 6%. With the State of Ohio cutting back on higher education funding in the same way it has cut K-12 funding, this growth in personnel costs will largely have to be covered with ever-increasing tuition. I believe the second problem is that we're doing a disservice to both the younger generation and our economy by perpetrating the belief that every kid needs to go to college straight from high school if they want to have a good life. Certainly, some kids are fully ready for college when they graduate from high school, and have access to financial resources which allow them to push right through to a degree, enabling them to start life with no debt. There's nothing wrong with that. But many kids aren't so lucky. They might not have taken high school as seriously as they could have, or just aren't academically or emotionally ready for the rigor of college studies. A report published by the Ohio Board of Regents says that about 40% of the kids who graduate from a Hilliard high school will end up taking remedial math or English when they get to college, and 10% will need to take both. Many will drop out of college, with time (and potential income) lost, no degree, and in debt. Maybe another path for those kids is to get some training in a trade, and spend a little more time sorting out their lives before deciding to make the investment in a college education. There remains in our society a demand for electricians, plumbers, carpenters, auto mechanics and the other traditional and honorable skilled trades. And there are all kinds of new jobs appearing. For example, I recently had a couple of medical tests done which required ultrasound imaging. I asked the young people doing the imaging where they got their training, and both said they had earned an associate's degree at Central Ohio Technical College, a public institution allied with OSU-Newark. Hilliard City Schools has for many years been a member of the Tolles Career and Technical Center. We are one of seven public school districts who make an education at Tolles available as an alternative to traditional high school. Students can graduate from Tolles with both a high school diploma as well excellent training in various skilled trades, many in high demand. It took me lots of years to earn my college degree. In many ways, I think my path was the best one possible - at least for me - taking all the tough math and sciences right out of high school when I still remembered how to do calculus, then business courses a decade later when I was beginning my managerial career and understood the application for those skills, and finally the humanities and social sciences when I was in my 30s, and a little more understanding of the richness and variety of life in this world. It was a pay-as-you go approach, with a little help from scholarships as well as my employer, who had a generous tuition-assistance program. Life is messy and unpredictable. It's also full of wonder and discovery. Maybe slamming right from kindergarten to a college degree or two isn't all that good a thing to do when you end up graduating to un/underemployment and a mountain of debt. And maybe if we shift our buying of college credits from a time in our lives when the magnitude of the investment isn't fully realized to a time a little later when we better understand the potential return on investment, we'll be better consumers, and will balk at the upward march of tuition. This forecast assumes $400,000 of new revenue from casino taxes in FY13, and $1 million of casino revenue each year thereafter. As I said in a prior article, I'll believe that when we see it. Mr. Wilson is wisely using numbers that are about a third less than estimated by The Dispatch. Comp/Benefit costs for the years FY13-FY16 are about $1 million higher each year than was forecasted in December. I suspect this is because not quite as many teachers took the early retirement package as we had anticipated, as the other assumption are the same from the last forecast, but will ask Mr. Wilson. (update: Yes, Mr. Wilson confirms that this is the reason). The student enrollment (ADM) is projected to grow very slowly, from 15,605 this year to 15,919 in FY16, a net increase of 314 students, which is 240 less than the December forecast. This will depend on what happens with the housing market. Currently, apartment housing seems to be all the rage, such as the new mixed commercial/retail/apartment development being proposed for the site at the corner of Cemetery Rd and Britton Parkway. Many of us are concerned about the way apartments housing school age kids distort the funding model for our schools, because the school tax revenue generated per dwelling unit in an apartment complex is much less than that generated by the typical new single family home. We're watching closely the number of students which come from new apartment complexes, as it would have to be much lower than 0.8 students/dwelling, which has been our average for a long time, in order to make the economics work out. 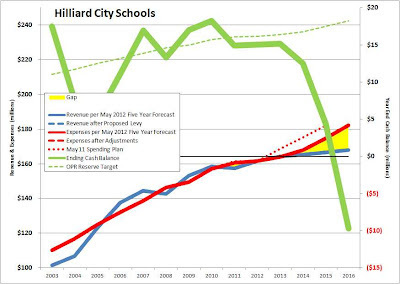 It doesn't help when the City of Hilliard uses a TIF to redirect money from the schools to infrastructure projects, as they did with the new Roberts Rd connector. 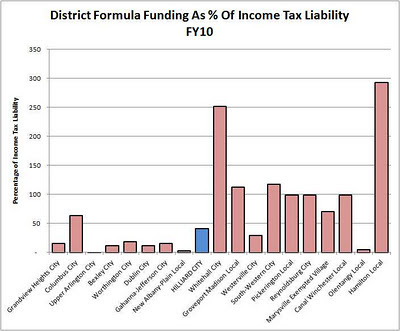 Of course, the loss of revenue from a TIF can be offset with new commercial revenue. However, the practice has been to apply a TIF to new commercial property as well, as is likely to be the case with the commercial/retail portion of the Cemetery/Britton development. The point is that when we get new kids without new revenue, the rest of us have to bear the cost, which is one of the drivers for additional levies. 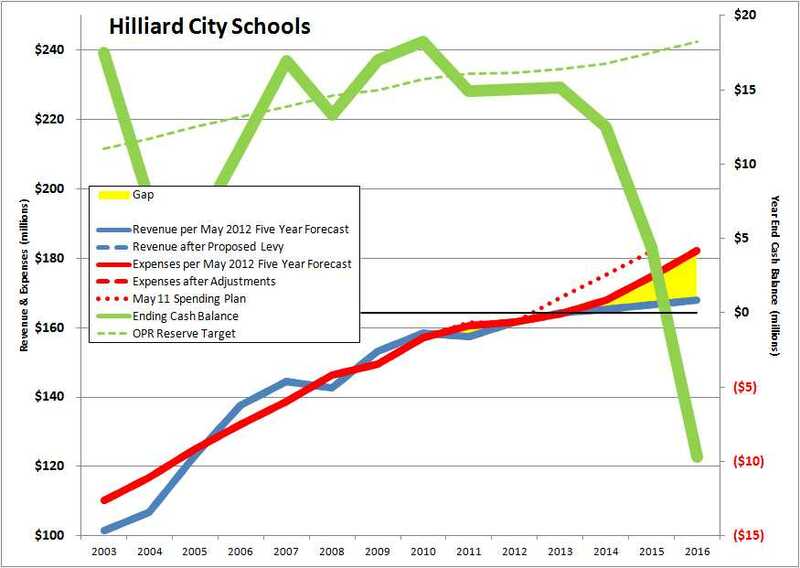 If you live in the City of Hilliard, please tell your City Council members and the Mayor that you're not interested in subsidizing developers and new residents. Net of all the increases and decreases in various line items between the last forecast and this one, our projected net cash position at the end of FY16 is about $1 million less than was projected in December, which tells me that we should still be able to stay off the ballot with another levy request until 2014. The need for serious, soul-searching conversations has not diminished. I don't assume that we can just continue spending money at this rate, and have the taxpayers of our district continue to cover it by increasing our taxes every 3 years or so. But to change the trajectory of our spending means changing things many of us hold very dear, and we aren't going to easily agree on what those things should be. But we need to get started, and not leave it for the levy issue. I look forward to your respectful comments. The School Board is scheduled to vote on new Student Manuals at our meeting on Monday, May 14, 2012 at 7pm at Alton Darby Elementary School. The Proposed Manuals can be read here. Please speak up prior to then if you have questions or concerns. The Columbus Dispatch ran a story today about how tax revenues from Ohio's new casinos would be funneled to our public school system. Ohio Revised Code section 5753.02 says the casinos will be taxed at a rate of 33% of gross revenues. ORC 5753.03(D)(2) says 34% of that will go to the "gross casino revenue county student as required by Article 6(C)(3)(b) of the Ohio Constitution." Article 6(C)(3)(b) says "Thirty-four percent of the tax on gross casino revenue shall be distributed among all eighty-eight counties in proportion to such counties' respective public school district student populations at the time of such distribution." Before we collectively yell, "Oh goody!" 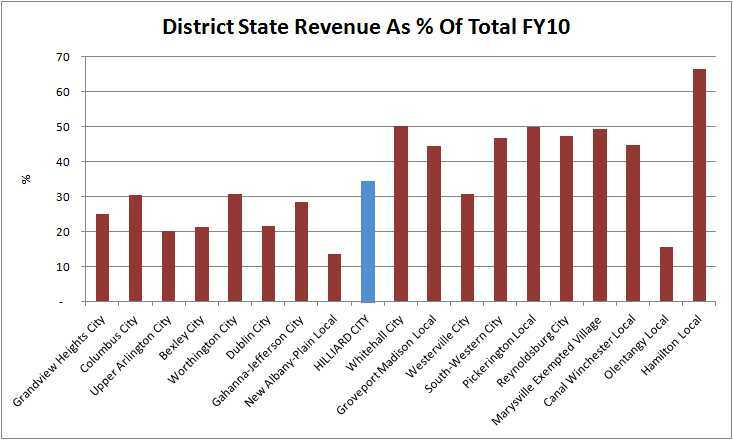 let's understand that while we may get every dollar shown on this chart, it doesn't necessarily mean that our aggregate funding from the State of Ohio will increase at all. 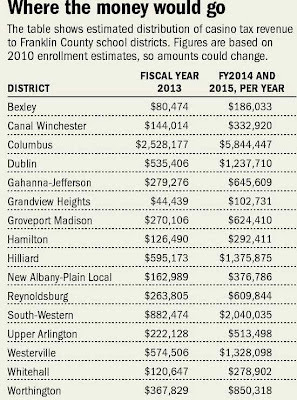 As I have been cautioning for many years, the folks in the Statehouse don't think our schools - Hilliard City Schools - are underfunded. They see a school district that is among the best in the state, and a community which has consistently voted to raise its taxes in order to preserve the programming and services offered, while paying its teachers, staff and administrators well. In other words, the folks downtown don't think we need more state funding to run our district at a high level of performance, and that allows them to send any new money they find elsewhere. So while this extra casino revenue may get put into one of the funding buckets that makes its way to us, there may be this much or more taken from other buckets. That's certainly what happened in the current budget, where basic Foundation Aid was largely maintained at prior year's levels, but the Personal Property Tax Reimbursement Phase-Out was accelerated. The Dispatch story quotes the Treasurer of South-Western City Schools, Hugh Garside, being skeptical that they'll see any net increase in state funding. I tend to agree with him.